The Canadian Association for the 50-Plus (CARP) is lobbying government to expand the Canada Pension Plan to a new Universal Pension Plan (UPP). CARP’s vision for this UPP is so ridiculous that they should not be permitted to participate in any serious discussion of pension reform. The proposed UPP would pay retired workers 70% of their pre-retirement income up to the salary limit for registered pension plans ($116,667 for 2009). This sounds wonderful. Because people tend to have higher incomes late in their careers, the 70% level would give retirees roughly the same income as working people, on average. This means that the average retiree would get to enjoy a middle class lifestyle without having to work or live off savings. But, how can we pay for this? CARP suggests adding additional payroll taxes of 9.9% of your first $46,300 and 15.4% of the rest up to $116,667! This is an enormous tax increase, but maybe not impossible. However, this is based on the current Canadian demographics. What will happen as our population ages? We may debate whether 18 and 19-year olds are children, but given that people tend to enter the full-time work force somewhere from 16 to 24, age 20 is a useful cut off between those who are supported and those who work full time. In 2006, for every 100 workers, there are 21 retirees and 38 children. However, by 2031, this will rise to 41 retirees and 35 children. For retirees to live a middle class life matching that of the workers, workers would have to pay about 29% of their incomes in payments to retirees. We get this figure by dividing the number of retirees (41) by the total number of workers plus retirees (141). The tax burden on workers would then be 29% for retirees plus whatever it takes to build schools and roads and pay for all the rest of government. This is about 20% higher than it is now. A Canadian worker might now get to keep 60% of his income, but his counterpart in 2031 would only get to keep 40%. It is absurd to think that workers would tolerate this situation. Tax rates would be so high that there would be almost no incentive to work. Our economic system would collapse. The inescapable conclusion is that either the majority of people over 65 will work or the majority of them will live well below the middle class standard. This isn’t a wish. It is reality. I would love to be able to count on huge government payments when I turn 65, but it can’t happen. CARP is doing its members a disservice by leading them to believe that the UPP is anything more than a pipe dream. Former president of Nortel Canada, Robert Ferchat, made an impassioned plea to save Nortel. His arguments are long on emotions, but short on specifics. Ferchat bemoans the potential loss of a 114-year old company with “a stellar reputation as a telecommunications industry leader.” He calls for public support of both the company and its current and former employees. Unfortunately, he is vague about what he means by “public support.” How many billions of dollars would it take to pay off all of Nortel’s creditors and fill up its pension plan? There is a good chance that the reason public officials at all levels have been silent on this issue is because the dollar amounts are simply too large. If public money were used to save Nortel in some form, I’m not sure what management should be put in place. It’s doubtful that public officials could handle the task, and existing management at Nortel for the past 11 years have managed to lose over 40 billion dollars! I share Ferchat’s desire to save Nortel, but costs matter. It may be that he has some good ideas for how to go about saving Nortel. If so, I’d like to hear them. A recent headline caught my attention: “Pandemic threat rocks economy.” Wow! First we had the financial crisis and now this. Maybe we’ll sink into a full depression. How will this affect your portfolio, and what can you do to protect your money? Okay, that’s enough sarcasm. I didn’t bother to give a link to the article because its body was quite disappointing after reading the blazing headline. It says that there is no evidence that the swine fly will turn into a pandemic, but if it did, the economy would suffer. Thanks for the pointless panic. 1. Do nothing. If my investments made sense before, they still make sense now. If a pandemic does affect the economy, equity prices will adjust too quickly for me to take advantage or protect myself. 2. Avoid news outlets with sensational headlines and little to back them up. Getting all frothed up with fear may cause me to make rash decisions. Buying and selling too often is expensive, both in terms of fees and the cost of buying high and selling low. 3. Think long term. What matters is where my investments are in 3 years or more. If I need the money sooner, I should have it in cash or a rock-solid fixed-income investment. My former employer Entrust Inc.’s stock is trading for $1.90 even though they have agreed to let Thoma Bravo buy them for $1.85 per share. What is going on that makes people pay $1.90 now to get $1.85 later? Do they expect deflation? This is clearly a case where the market thinks it knows something that I don’t know. Perhaps investors hope that another suitor will come along and pay a higher price. I don’t know of any other interested company, but who knows. This creates a reverse version of the usual takeover arbitrage. In the normal case where a stock trades below the takeover price, an investor who is confident that the takeover will go through buys stock to later sell it at the higher price. In this case, the investor who is confident that the takeover will go through can short Entrust stock and later buy it back when the takeover happens. However, I’m not confident enough about what will happen to try any form of arbitrage. So what if the Management Expense Ratio that I pay on my mutual funds is 1% or 2% or 3%? If I’m planning to at least triple my money before I retire, why should such tiny percentages concern me? The MER is more like property taxes; you are taxed on what you have instead of what you make in a year. However, property tax rates are much lower than income tax rates. In my area, property taxes amount to between 1% and 2% of the value of a property each year. And at least the city takes my garbage away. Suppose that your mutual funds charge a 2% MER. The rest of this will be easier to follow if you think of this as you getting to keep 98% of your money at the end of each year. After two years, you get to keep 98% of 98%. Pull out the calculator to multiply and you’ll find that you keep 96.04% of your money after two years. This is a form of compounding that works against you. How bad does this get in 25 years? After paying 2% each year for 25 years, 40% of your money is gone. If you were expecting to have half a million dollars when you retire, $200,000 would be “missing”. It might seem like the investment returns in the mutual fund should be a factor in all this, but these returns don’t affect the percentage of your money that is taken in the MER. Whether the investments do well or poorly determines whether the MER is a percentage of a big pot of money or a small pot, but the percentage stays the same. The MER is definitely not the only thing to look at when investing in mutual funds, but it is too important to ignore. 1. Larry Swedroe attacks the persistent myth that active fund management outperforms in bear markets. 2. Canadian Financial DIY is calling for Canada to follow the UK lead by offering auto trade-in incentives. I like this as a replacement for just giving money to the car companies because the free market is more involved, but I don’t like it as additional public money flowing to doomed car companies. 3. Canadian Capitalist takes a swipe at market gurus who base their predictions on cycles. By mixing and matching the right cycles, I’m sure that I could come up with predictions for the TSX in 5 years to be at 1000 or 2000 ... or 100,000. One of them is bound to be close to accurate. 4. Larry MacDonald gives us 11 trading tips from billionaire investor George Soros. 5. Ellen Roseman looks at the charges for using Aeroplan miles for “free” reward tickets. I collected Aeroplan miles for years, and fortunately I used most of them before the rules changed and they became mostly worthless. 6. Patrick at A Loonie Saved makes the financial case for renting rather than owning a home. 7. Preet has a story of someone who leased a car and the dealership tried to change the terms of the signed contract a few weeks later claiming that a mistake had been made. The amount of money at stake is $2100 over 4 years. I’d be interested in hearing how this ends up. 8. Million Dollar Journey explores inheritances, giving away money before death, and bequeathing money to charity. 9. Big Cajun Man’s weekly video is can you trust your financial advisor? 10. Clever Dude gets an amusing offer from a fitness club. See if you can spot what’s wrong. If you try to move retirement savings from one institution to another the wrong way, you can encounter roadblocks, unanswered phone calls, and extended delays. Money has to be pulled rather than pushed. In physics class, students are told that “you can’t push a rope.” This means that if your calculations result in negative tension on a rope, the rope goes slack rather than actually pushing. If you want to move retirement savings to a new institution, the best way to go about it is to have the destination institution pull the money away from the old institution. Many people believe that to move retirement money out of a brokerage, they have to talk to their existing brokerage to have the money sent elsewhere. Unfortunately, the existing brokerage has little incentive to cooperate. They may try to pressure the client to stay and may try various delay tactics. In yesterday’s discussion of what holds people back from making the switch to low-cost index funds, Mark Wolfinger suggested that some people would fear a confrontation with their existing financial advisor. I think Mark is right that many people would have this fear. However, it usually isn’t necessary to talk to your financial advisor to make a change. By simply filling out a form at your new institution, you can instruct them to pull the money out of your old account. Your financial advisor may choose to contact you, but this has never happened to me. Every time I’ve closed down one account and sent the money to another, all I’ve had to do is fill out a form at the new institution. The conversation then goes to the advantages of low-cost index funds, but ends as soon as I explain that this polite person can’t just instruct his financial advisor to switch him into low-cost index funds because the advisor won’t collect commissions that way. The prospect of opening a discount brokerage account and doing the buying and selling themselves seems to be a deal breaker. Whether the problem is laziness, fear, not believing me, or not trusting themselves, they seem unwilling to make a change even though it will save thousands of dollars each year. I don’t give anyone a hard sell, partly because it doesn’t work and partly because I don’t know their business well enough to give advice. However, I find it interesting that some people seem interested, understand what I’ve said, believe that they can save a lot of money, and yet they remain paralyzed. Most of us prefer a nice steady income rather than a highly variable income. However, one of the advantages of a variable income is the up years. Unfortunately, with an up year comes an increase in income taxes. A consequence of our progressive tax system is that people with variable incomes end up paying more income taxes. If Ted makes $50,000 per year and Alice has alternating years of $25,000 and $75,000, Alice will pay more tax (assuming that everything else is equal) even though they have the same average income. One way for Alice to compensate for this unfairness is to make RRSP contributions only during her higher income years. Compared to making her contributions every year, this strategy gives her a bigger tax reduction for the same total contribution. So, if you have the happy circumstance of earning more money than usual in 2009, consider using some of the extra money to catch up on RRSP contributions. You might also consider making some necessary home repairs to take advantage of the Home Renovation Tax Credit. I’m in the unhappy situation of having to declare a large chunk of income in 2009 without actually having received the money. Coincidentally, I’m going to have to replace my furnace and roof this year. At least my accumulated RRSP room and Home Renovation Tax Credit will give me tax savings at the top marginal rate. Serious market timers sold completely out of stocks at some point during the recent market crash. Some have bought back in at least partially, but others remain on the sidelines with cash. Since March 9, the TSX composite index has risen 24.7%. This represents between 2 and 3 years worth of average stock markets gains. Stock prices may yet reverse after this recent rally, but what if they don’t? Will the market timers return when the TSX gets to 10,000? If not, then maybe 11,000? No bell is going to ring to let everyone know that the sharks are gone and it’s safe to get back in the water. For every market timer who crows about selling high and buying back in at low prices, I’m betting that there are two or more less talkative market timers who sold low and will ultimately buy back in at higher prices. I’ll stick to my strategy of staying fully invested through the ups and downs. 1. Wealthy Boomer continues the discussion of harmonized sales taxes on mutual fund MERs (the web page with this article has disappeared since the time of writing). Although he mentions both sides of this issue, by calling the HST a “wealth tax” in his headline, he is decidedly on the side of the mutual fund industry on this one. I just don’t see this as a wealth tax. The tax is applied to the outrageous fees charged by mutual funds and not investor portfolios directly. Investors can eliminate most of the MER and taxes on these MERs by dumping mutual funds and buying index ETFs. 2. Ellen Roseman is calling for a ban on door-to-door sales by energy marketing firms. She has been hearing many complaints about deceptive sales practices. I’ve had my share of liars at my door trying to trick me into buying an overpriced energy contract. 3. Big Cajun Man finds that some price matching promises from Best Buy and Future Shop aren’t worth much. 4. Canadian Capitalist lists some of the top online tax resources available to Canadians. 6. Larry MacDonald highlights the economic forecasts of two experts, one a bull and the other a bear. I don’t believe that either one of them knows what will happen in the short term. 7. Preet explains standard deviation of investment returns and how variations are large over just one year, but yearly returns tend to average out over longer periods. 8. Million Dollar Journey explains how to claim your home office on your income taxes. 9. MoneyNing shows the devastating effect of high MERs on portfolios using pictures. Global sales of personal computers dropped just over 7% in the first quarter of 2009 (the web page with the supporting article has disappeared since the time of writing). It’s tempting to blame this on the current state of the economy, but I think there are other things going on. In the past, most personal computer upgrades were needed to get a more powerful processor or more memory to run the latest useful application. This reason is starting to fade. Most personal computers bought in the last couple of years are powerful enough to show videos, the most demanding application used by almost everyone. Upgrading a PC to run the latest video game still goes on among gamers dedicated to having the latest fast-moving game, but they are a fairly small minority of PC owners. Most people are content with simpler games that run just fine on a PC that is a year or two old. Even the widespread use of Firefox has made browsing faster and more reliable, thus reducing the need to replace one’s PC. Another driver for PC upgrades is virus infestation. Unsophisticated PC users often have computers running at a crawl because of various unwanted programs. Not realizing what is going on, some people just replace the PC. However, cloud computing is making it easier to deal with virus problems. Many people have their email residing out in the cloud and as long as all their important documents are lodged in an email somewhere, there is little need to perform a backup before wiping the hard drive and starting over. All indications are that the amount of money spent per person per year on personal computers will continue to drop over time unless some new compelling application comes along. It will be hard to find something more compelling than on-demand video, but you never know. Warren Buffett has taken a 10% stake in a Chinese electric car company called BYD for $230 million. He tried to buy 25% of the company, but the founder, Wang Chuan-Fu, turned him down! BYD is a sign of the future for car companies. A normal part of progress is for upstart companies to take over industries while old companies die off. In this case, it is GM, Ford, and Chrysler that are at risk of dying off. When companies have been around as long as these three, it’s hard to believe that they could fail, but they have demonstrated that the North American car industry would be better off without them. A big change in the form of electric cars is coming, and new upstarts are more likely to satisfy customers than the old dinosaurs. I would prefer that the upstarts were home grown, but the change is coming whether we do it or the Chinese do it. The race is on for what will be a huge market, and Canada and the US are piling resources into saving dinosaur car companies. Instead of saving the old companies so that they can hold back the upstarts, we should be nurturing the upstart car companies. Investment firm Thoma Bravo is buying my former employer, Entrust Inc. You’d think that since I haven’t worked there for nearly 8 years, I wouldn’t have strong feeling about this takeover. Unfortunately, due to bizarre tax laws this is going to cost me a 6-figure tax bill for 2009! You see, back in the heady days of the late 90s, most people working in high tech got stock options. These options give the holder the right to buy shares at a fixed price. When the stock goes up, the holder of the options gets to buy the shares at the lower price and make money on the difference. Unfortunately for me (and many others), I bought shares, but hung on to the stock. So, I got shares at a cheap price when they were trading ridiculously high, but then sat on my hands and watched the share price make a long, sad descent. Now, I’m being forced to sell my shares to Thoma Bravo for a price lower than I paid for them. But, that’s the way it goes with stock ownership. I bought the shares for $2.13 each and am being forced to sell them for $1.85, a modest loss. The twist here is that the government wants me to pay taxes on the value of the shares back when I bought them (over $20 each). So, I bought the shares cheap, sold them even cheaper, and I get to pay taxes on the ridiculously high price (that I never actually received). Let’s call the value of all the shares at the time I received them “huge number”. I prefer not to disclose the actual amount, but let’s just say that if I had this phantom amount in cash, I could buy a nice house and several cars. But, remember this huge number doesn’t exist as real cash and never really did. Fortunately, this huge number is taxed at the same rate as capital gains; so, I only have to include half of it in my income. I figure that I will have to pay about 22% of the huge number in added income taxes. The sale of the shares will get me only 9% of the huge number. So, next April I’ll have to come up with about 13% of the huge number. Ouch. A while back employees of SDL Optics (later acquired by JDS Uniphase) got caught with this problem. Most of these people weren’t high rollers. They worked for modest income, bought into a company savings plan, and were surprised with a tax bill amounting to a few years pay. For some reason the government decided to forgive their debts, but not the debts of many other people in the same situation. This whole business could be fixed if the government allowed stock option gains to be offset against capital losses. After all, they’re both taxed at the same rate. Instead, I’ll pay a lot up front and get a huge capital loss to carry forward to eliminate future capital gains. In theory this just changes the timing of when people pay their taxes. In practice, this tax law has devastated some people’s finances so badly that they have little hope of owning enough stock to ever earn enough capital gains to make use of the huge capital loss. So, the only case where the current tax law makes a meaningful difference is when it ruins someone. I can’t understand why the government thinks it makes sense to wipe someone out with a tax bill far exceeding any money they received. No doubt some people think this is a problem for wealthy high rollers who partied hardest during the tech boom. The wealthy people are the ones who will get their money back anyway using the capital losses in the future. It’s the smaller guys who are permanently harmed. The first thing to realize is that whether you have a mortgage or not, you are exposed to the full volatility of the value of your house. The bank that gives you a mortgage isn’t your partner in your home investment. If your home’s value drops, the bank will still want all of their money back. If you decide to take a mortgage, then your portfolio will consist of your house plus the investments you make with the money you have on the side. You would be using leverage to increase the size of any portfolio gains. Unfortunately, any losses would be magnified as well. Throughout my life, I preferred the simplicity of paying down my mortgage fast and living without any debts. Others prefer to go for greater investment gains with the increased risk of using a mortgage for leverage. This is a personal decision about whether you’d be prepared to live with lower spending or trying to earn more income if your investments go south. If PR chooses to take a mortgage, he should seek advice to structure the investments and debt so that the interest payments are tax-deductible. This is easy enough in the US, but can be tricky in Canada. Although PR’s question is whether or not to take a mortgage, the fact that the stay in the house will be only 3 years makes me think that a third option is possible. Why not consider renting? This would eliminate many thousands of dollars in real estate and legal fees to buy a home and then sell it after only 3 years. Renting would also eliminate the risk of fluctuating house prices. I was only a renter for a short period of time when I was young and didn’t like having a landlord, but I would consider renting again if I knew I’d only be staying in a city for 3 years. In my usual style, I haven’t actually told PR what to do, but tried to give him some useful information in making his own decision. Hopefully PR will let us know what decision he makes. For the portion of income over $400,000, the tax rate is 80%. Add the Quebec provincial rate of 13.2% to this, and you get total tax rate of 93.2%! 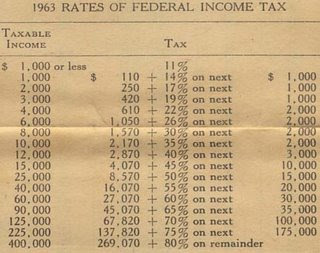 The corresponding US tax rate in 1963 on income over $400,000 was either 87% or 91% depending on what their footnote 7 means. 1. Larry MacDonald warns holders of iShares ETF units to watch out for MER increases. Barclay’s PLC sold its iShares business (including the popular ETF XIU) to CVC Capital Partners. 2. Canadian Financial DIY has done extensive testing of Canadian Web tax software, and has found inconsistencies among the many available CRA-certified products. CRA has replied with an explanation of what CRA certification does and does not cover. It turns out that CRA certification means a lot less than I had assumed. You may be surprised as well. 3. Preet asks whether parents should cut their kids’ allowances during a recession. I can’t see doing this for young children, but it may make a good lesson for a mature 15-year old. The risk is that it will seem like random undeserved punishment without delivering the intended lesson. 4. Big Cajun Man reports that the number of billionaires worldwide has dropped by about 30%. I guess they lost a lot more money than I did. Dollar-cost averaging is often described breathlessly as an investing technique that can pump up investor returns magically. This view of dollar-cost averaging actually contains two myths, and its real advantage is something completely different. Dollar-cost averaging refers to investing a fixed dollar amount periodically to take advantage of stock price fluctuations. This is best illustrated with an example. Suppose that Mary saves $600 each month to invest in her favourite stock index ETF that has an average price of $30 per unit over the course of a year. In this scenario, the ETF price stays steady at exactly $30 per unit each month. Mary buys 20 units each month for a total of 240 units by the end of the year. Now suppose that the ETF price bounces between $20 and $40 from month to month. The average price is still $30, but look at what happens to Mary’s purchases. Half of the months she buys 30 units, and the other half of the months she buys 15 units. Over a year this adds up to 270 units. Mary seems to have picked up 30 extra ETF units out of thin air. A more realistic volatility level is for the ETF price to bounce back and forth between $28 and $32 from one month to the next. In this case Mary ends up with 241 ETF units. She’d rather have the extra unit, but it’s not enough to get excited about. Myth #1: Dollar-cost averaging significantly pumps up returns. For normal levels of volatility, dollar cost averaging gives only a small advantage over the no volatility case as we saw in the example. Myth #2: Dollar-cost averaging is an investing technique. Dollar-cost averaging isn’t even really a choice for most of us. We get paid periodically and save some fraction of it. Every month, quarter, or year we build up enough savings to make it worthwhile to invest. What choice do we have when investing other than dollar-cost averaging? If Mary had come into a large lump sum such as an inheritance, she would have a choice to make. She could either choose some sensible asset allocation and invest all of the money right away, or she could spread her investment purchases over several months or years. The truth is that the benefit of dollar-cost averaging is small compared to the lost returns from waiting to invest the money over time. A study of historical investment returns would show that, on average, Mary is better off investing the money right away. The real benefit of dollar-cost averaging. The real benefit of dollar-cost averaging isn’t the extra units that pop into existence through the magic of math. Investors who use dollar-cost averaging are consistent savers. If the idea of dollar-cost averaging motivates her to keep saving and investing then that’s wonderful, buy it’s the fact that Mary saves money every month that helps her finances. Discussions of dollar-cost averaging are mostly a distraction. Their only meaningful benefit is to encourage people to save regularly. In an interview with Charlie Rose, Warren Buffett discussed the mortgage crisis and said “beware of geeks bearing formulas.” It turns out that you don’t need to know any math to understand where these formulas go wrong. There are a whole host of Greek letters that represent investing formulas that few people understand. We have alpha, beta, sigma, and five other letters that are associated with stock options. Even people who rely on these formulas often don’t know much about them. A trader may tell you that he buys stocks when one or more Greek letters have certain values, but this is different from understanding what the numbers mean. One thing the formulas have in common is that they are usually calculated based on recent history of equity prices. So, any investing decision based on these formulas is necessarily a reaction to recent events. Often this results in traders gambling that the near future to be similar to the recent past. This sort of behaviour is similar to the gambler who bets on the outcome of a coin toss. A string of heads makes some gamblers bet on heads because they think the coin is “hot,” while other gamblers think that tails is “due.” Of course, they’re both wrong. A fair coin has a 50/50 chance of coming up heads or tails regardless of what has happened on recent tosses. To illustrate what can go wrong with formulas, let’s look at an example. Suppose an investment called a “Dollar Bond” pays a dollar every trading day. However, each day there is also a 1 in 50 chance that it will be a bad day where 5% of the remaining bonds disappear. So, if you own 100 of these bonds, you’ll get $100 each day. When a bad day happens, you’ll suddenly only have only 95 Dollar Bonds and will get $95 per day until the next bad day. To estimate a fair price for Dollar Bonds, let’s assume that the risk-free interest rate is 4% per year. To give an expected return of 4% (assuming 250 trading days per year), the price of Dollar Bonds works out to $864 each. Of course, Dollar Bonds have volatility, and investors would actually want to pay less than $864 depending on their level of risk aversion. In the real world, we don’t actually know the exact probabilities of bad outcomes. If we were to use the same principal as the Greek letter formulas, we would estimate the chances of a bad day by examining the number of bad days in the past. This leads us to my own Greek letter formula that I’ll call iota (because you shouldn’t give it an iota of respect as we’ll see). 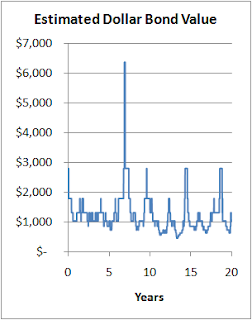 To calculate iota, we take the number of bad days over the past year and use that to come up with an estimate of the value of a Dollar bond that gives an expected 4% return. For something that is supposed to have a steady value of $864, the iota measure sure jumps around a lot. In fact, iota jumped to over $6000 briefly around year 7. This is because there happened to be a period of just over one year with no bad days. So, for a short time, iota thought that bad days never happen. Pity the poor investor who bought Dollar Bonds then and promptly lost most of his money. Of course, any math guy worth his salt would look at this chart and change the way iota is calculated to make its output smoother. But that doesn’t mean that the new measure would necessarily be any better. It would just seem better. Formulas named after Greek letters tend to seem impressive, and we give them more respect than they deserve. It’s dangerous to use any formula if you don’t understand how it works and what its limitations are. I use mathematical analysis every chance I get, but not as a replacement for thinking. I received exciting news in the postal mail. Apparently, Prizemasters International has undergone a rigorous selection process for their lottery offer, and I qualify for a chance at my share of $4,000,000.00! I wasn’t aware that a multi-stage evaluation was ongoing, but apparently in stage one I received a grade of 100 and made “selected – unrestricted status.” In stage two I received a grade of A qualifying me for the “elite offer.” In stage three I made first grade giving me “bonus 1 & 2.” It took a while to figure out from the various bits of paper that the offer was to enter a lottery, or a draw to get into a lottery, or something like that. In fit of altruism, I decided not to accept the offer because it would reduce other people’s lottery winnings. I also figured that Prizemasters would likely want their papers back to use again. So, I folded up all the papers that didn’t have my name on them and stuffed them into the reply-paid envelope to send back to Prizemasters. It’s tempting to actually send the reply envelope, but I’m not sure that it is really reply-paid. It could be that Prizemasters is only interested in people who use the telephone or fax options. They might also count on people to pay for postage after the envelope is returned by the post office. So, as much as I’d like to mail this junk back and cost Prizemasters some money, I won’t in case it just costs Canada Post some money. Retaliation rarely works out as well as we hope it will. When I asked Mike how he got paid for helping us, he managed to give an answer that steered me away without really answering. Slowly over the next few years of reading investment books, I managed to fill in the story. Mike and his firm got an up-front commission of 5% of our investment right away, and they later got a trailer commission of 0.5% of our money each year. These commissions were paid out of the mutual funds’ management fees and back-end loads, making them invisible to my wife and me. The exact percentages may vary from fund to fund, but the basic idea is the same: financial advisors usually get up-front commissions and trailers. 1. Canadian Financial DIY lists the benefits of working after retirement. I suspect that many people will find this necessary whether they enjoy the benefits or not. We face a future with fewer and fewer working age people per retiree. 2. Ellen Roseman warns us not to buy insurance from banks. Sadly, it's not an April Fool's joke. 3. Big Cajun Man reviews the book Complete Idiot's Guide to Getting out of Debt. 4. Million Dollar Journey gives 6 ways to lower your phone bill. 5. Preet explains why a bear market leads to more insurance sales. When gamblers are losing money, they often start increasing the size of their bets to try to get even. A familiar example of this is the double or nothing bet. It’s not just Blackjack players who do this. When stock prices drop delaying retirement dreams, some investors suddenly switch to low-return conservative investments, but others start making reckless investments in an attempt to make back losses quickly. Soros is clearly advising investors to avoid the double-or-nothing mentality by saying not to try to recoup. Superficially, it may seem that he advocates a switch to conservative investments, but this isn’t really what he is saying either. Soros routinely used leverage (borrowed money) and his talk of retrenching and starting small at least partially means to reduce the amount of leverage. Having reduced your bet size (starting small), Soros is advocating continuing your investment approach on a smaller scale. One interpretation of Soros’s remarks is when things go south, don’t give up and switch to low-return conservative investments, and don’t take wild chances trying to recoup losses; stick to your investment plan with your smaller portfolio. Whether you’re a passive index investor or an active trader like Soros, it makes sense to avoid overreacting to losses. I offer this morning’s small April Fools’ joke with apologies to Signetics who ran an ad in 1972 for write-only memory. Sadly for the victims of Bernard Madoff’s huge Ponzi scheme, the concept of a Deposit-Only Bank Account (DOBA) is all too real. It doesn’t much matter how good the investment returns are if you can’t ever withdraw your money. New players are breaking onto the banking scene offering low-cost specialized services. Traditional banks try to be everything to everyone by offering a huge array of services including various types of loans, bank accounts, retirement investment accounts, and many more products. The new players are specializing in individual banking services. By specializing, these new banks hope to offer the best service and lowest fees in their specialty. Initially, the so-called DOBA banks are offering bank accounts with no transaction fees, no minimum balances, and the highest interest rates in the industry. For some reason, the first product that these new banks are specializing in is the DOBA (Deposit-Only Bank Account). In time perhaps banks specializing in the WOBA (Withdrawal-Only Bank Account) will enter the fray as well.